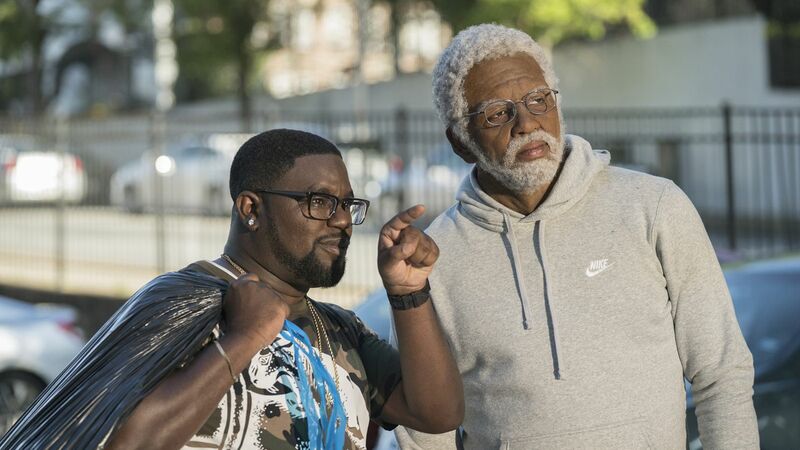 Highly entertaining and even more endearing, the elderly basketball romp “Uncle Drew” is the surprise comedy of the summer. The film, which features beloved NBA stars under layers of old-age makeup and a lead character who was developed for a series of Pepsi web videos, is just so incredibly strange that its genuine humor and heart catch you off guard. Writer Jay Longino and director Charles Stone III craft an underdog story around the character of Uncle Drew, a septuagenarian street baller invented and performed by 26-year-old Boston Celtics point guard Kyrie Irving, who simply channels the cantankerous old player. The film is guaranteed to make Irving a Hollywood star. He's that charming on screen, even under layers of latex. But “Uncle Drew” has several MVPs who make the movie work. Lil Rel Howery, who played everyone's favorite TSA agent in “Get Out,” easily transitions from sidekick to leading man as Dax. He's a basketball fan who dreams of running the court at the legendary blacktop tournament Rucker Classic in Harlem. (The $100,000 prize is also tempting.) Dax stays on the sidelines, coaching, still smarting from a wicked block laid down by his rival, Mookie (an off-the-wall Nick Kroll), as a youth. When Mookie swipes Dax's star player, team and girl (Tiffany Haddish), enter Uncle Drew. He seems to exist mostly in legends and rumors — storied for his skills and style. He never made it big after his team broke up and they all disappeared in the ‘70s. Now he spends his days schooling “youngbloods” at every playground court in town. When Dax links up with Drew, it's time for the best part of any sports movie: putting together a team of wacky characters. They hit the road in a retro van to pick up Preacher (Chris Webber), Lights (Reggie Miller), Boots (Nate Robinson) and Big Fella (Shaquille O'Neal). Do these NBA stars ever deliver. The joking, joshing, trash-talking and ad-libbing is nonstop, and it all feels easy and natural. Howery has some of the best humorous asides, and his chemistry with Irving keeps the film on track. “Uncle Drew” hits all the familiar sports movie beats with its classic tournament structure. It's a blast to watch the players ball on screen, though, of course, the only way to make these pros fit the underdog trope is to age them up under layers of prosthetics. Initially, the outlandish characters are bizarre, if hilarious, but each performer makes them memorable, especially Webber as the charismatic and coiffed Preacher. While the film loses some steam at the end, coasting on clichéd platitudes, the emotional groundwork has been laid for generic motivational quotes such as “you miss 100% of the shots you don't take” to actually land. Especially when they’re coming out of Irving's mouth, who takes the caricature and makes it into a real character. Make no doubt about it, “Uncle Drew” is a very silly film, old-age makeup and all. But it's got humor, heart and a killer soul soundtrack. You'd be soulless to not find some joy in this movie that's pure summer fun.